Whether a mechanic, carpenter or an ordinary guy, or girl, you’ve likely came across some rusty tools before. Hand tools are extremely vital to numerous job sectors and industries. They are very versatile, and often interchangeable, as they can help the vast majority of people complete numerous tasks. However over time, these tools can often become rusty from usage or storage. When people leave their tools in a cold, enclosed toolbox for an example, the tools get colder than the surrounding aid, and moisture ends up clinging to these tools, causing rust. Although rusted tools may not look aesthetically pleasing, they are still generally functional. 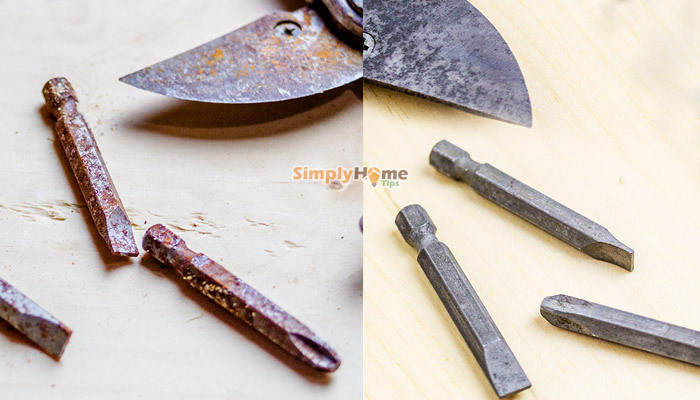 However, if you wish to remove the rust from those tools, and make them look almost like-new, follow some of these steps below to remove rust from your tools. First, you should place your tools in the bucket and cover them with the vinegar. Next, you must let the tools soak for 24 hours in order to absorb the vinegar. After soaking, you must get to scrubbing. 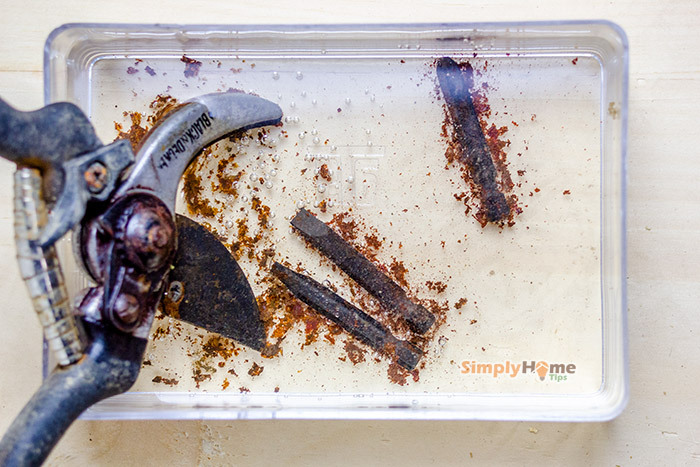 The vinegar soaked in the tools will eat into the rust and allow for an easy scrubbing process to remove the rust. Most importantly, you must make sure to thoroughly rinse the vinegar off of the tools so they don’t rust again. Lastly, after rinsing and drying the tools, spray them all with WD-40 so they don’t rust again. WD-40 is a widely used substance to help keep metals from rusting. Start by rinsing the tools in soapy water in order to remove dust, dirt and grease from them. Make sure you rinse and dry them thoroughly. Always start by scrubbing the tools with the coarsest abrasive to remove built up rust. Next, switch to a finer sandpaper to smooth out the grooves caused by the coarse grit. For more severely rusted tools, you may want to consider using kerosene, which will act as a cutting lubricant. If the problem still remains, you may want to consider a more powerful solution. This method is excellent for moderate rust issues. Additionally, it is very useful for hard to reach rust spots since this acid gets right into the joints and crevices to solve the rust problem. First, thoroughly clean the tools with dish detergent in order to prevent lingering dirt and grease from blocking the chemical process. Next, make sure to put on your goggles and gloves for protection. After, mix three tablespoons of oxalic acid with one gallon of water in the large plastic container. Make sure the solution covers the tools completely. Next, let the tools soak in the container for about 20 minutes, or until the rust is gone. Then simply remove them, rinse them clean again and dry the tools thoroughly. Lastly, store the tools as usual. To use this method, combine lemon juice and salt in a sizeable container, and rub the combined solution on by using a steel wool or sandpaper. 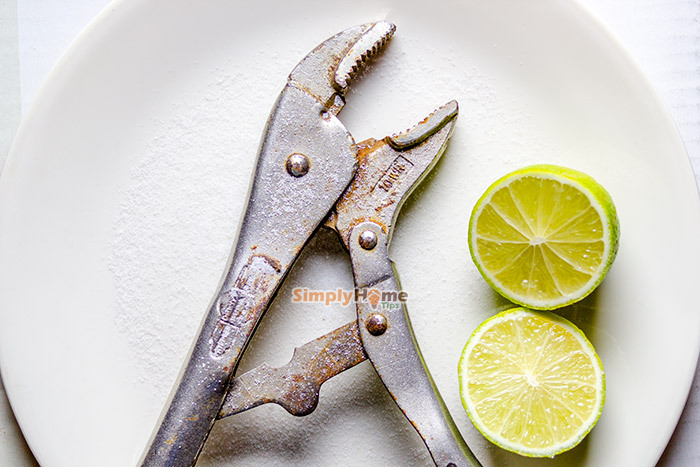 The salt will act as a corrosive or an abrasive, while the acid present in the lemon juice cuts through the corrosion. For severely rusted tools, let the solution settle on the surface of the tools for some time, five minutes or so. When the corrosion has been removed, wipe down the tool with a dry cloth. First, fill the first container with vinegar to where the tools will be completely covered when submerged. Next, drop the rusty tools in the vinegar and let them soak for about 3-5 minutes. After that, remove the tools and scrub away with a toothbrush. After scrubbing, fill the other container up with one third baking soda, and two thirds water. Then simply place the scrubbed tools in there for about five more minutes. After this, rinse clean the tools with water, and make sure to dry them immediately with paper towels. For hard to reach areas and tight spaces, you can try using a hair dryer to make sure they are dry in order to prevent further rust. Lastly, you can apply the coconut oil on the tools to apply additional rust protection in the future. Many people also use WD-40 as a rust preventer. This is a very renowned method for its simplicity. First, you must pour a sufficient enough amount of the Coca-Cola into the bowl, tub or container. Next, simply drop your rusty tools in there and let the settle for 24 hours, depending on the corrosion level of your tools, and make sure the Coca-Cola completely covers the tools. Severely rusted tools may require additional time. Next, simply remove the tools after no rust is present. Additionally, apply oil or WD-40 on them to help keep them from rusting again. This works very well since Coca-Cola is loaded with phosphoric acid. This acid is capable of dissolving iron and iron oxide, or rust. However, since this phosphoric acid melts iron oxide very quickly, do not leave the tools in the solution for a long time, as they may get even more corroded. A few days however, will get rid of the solution no problem. 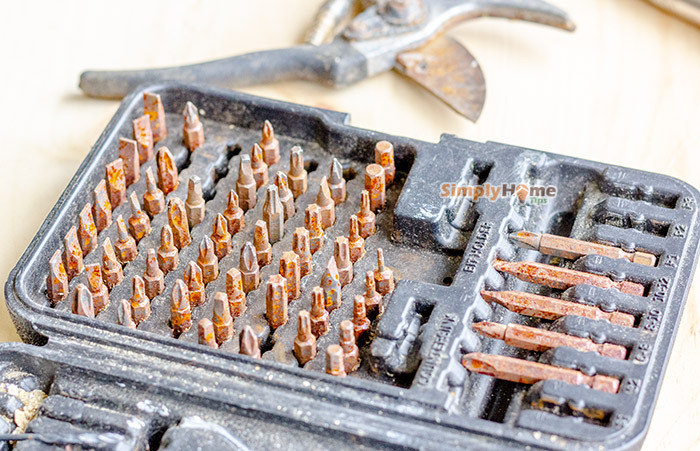 Rust is inevitable, and it continues to corrode tools faster and faster once it starts. Making sure to take care of your prized possession of hand tools, saw blades and screw drivers is vital since the majority of people use these tools on a daily basis. Tools are also not cheap, so ensuring they stay like new, and ready for any project at any given moment is critical. But in case you face some nasty, rusty tools, you can use one or more of the above methods to bring them back to life.